Such an enigma - thought he was woefully wasteful yesterday.........till he scored. Definitely an enigma mate. For a player at such a high level, his touch let’s him down so often. At times though his pace means he is able to retain the ball but if he works on that first touch, it would make a big difference to his overall game. As good as his first goal is, I loved that second goal. The way he takes control and rather than waiting for Salah to make a run, says, “here I’ll sort it” and 87 minutes in to the game still has the energy to make that darting run and presence of mind to lift it over the keeper. Thing is I just don't have the A’s much faith in Sadio to play Mo in (consistently) in same circumstances. Not a pop, as such, just niggling frustrations at an outstanding talent. Anyone else slightly worried about his contract situation and general demeanour? Final year next season? I am worried He deserves the same amount as Salah tbh! Thought the same mate, was doing my head in till that corker of a first goal then that sumptuous 2nd. Did anyone notice when Mo came up to him to celebrate the goal, Sadio had an angry look on his face and he just chest pumped Mo and walked off? Don't want to make anything off it but just noticed it and thought there maybe could have been a bit more love between the 2 of them. think he wants to be top scorer and a few times he could have put Mo in he didn't. Top goal scorers aren't usually the best providers and the competition between the two of them will drive them on. He always seems a bit reserved in his interviews but on LFC TV he was quite jokey whilst Shaqiri was being interviewed. Like I say I think he’s always gonna be one of those players and that unpredictability (at times unreliability) is what makes him so dangerous and damned near impossible to mark. 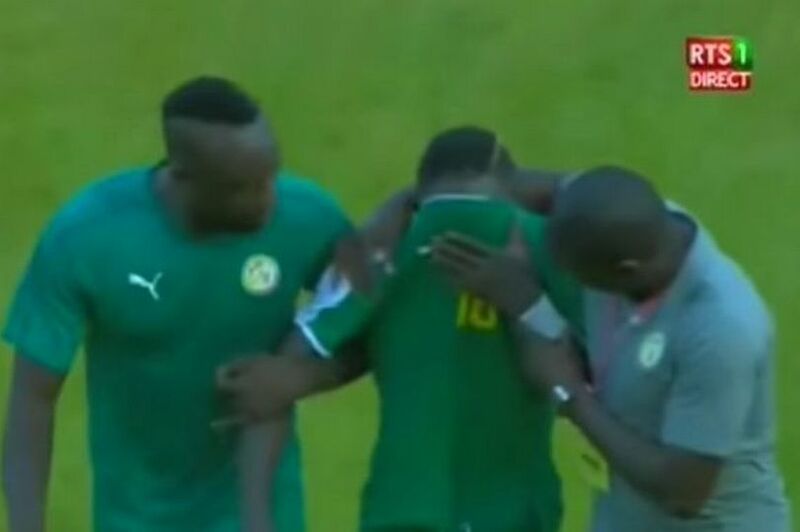 Went off crying after Senegalese fans started to give him sh*t for missing an easy chance. Saw the scene. Kinda felt for him. I'm not a professional athlete, but I imagine it must be hard sometimes to put on the NT shirt, have your country and the fans in mind and then slump to a bad performance only to get booed by those same fans. I get it, its football, but my guess is that sometimes it must be hard and the pressure piles up and some crack. Hope he is okay and ready to put that all behind with a brace next saturday! I like Sadio. Always gives this warrior vibe on the pitch yet in all his interviews he seems very shy, calm and gives this vibe of being somebody very nice. It is always shameful to boo your own players even if they play badly. Hope that he is not injured but just a dip in his national form. Concerns grew after footage emerged of the winger being consoled by team-mates. Fears over Sadio Mane have been eased after the Liverpool star was seen walking off the pitch in tears following Senegal's win over Equatorial Guinea. Mane was injured the last time he was on international duty, requiring surgery on a broken thumb last month. Concerns grew after footage emerged of the winger being consoled by team-mates following the 1-0 victory on Saturday night, despite Senegal already qualifying for the Africa Cup of Nations next year. Mane pulled his shirt over his head, struggling to hide his emotions, leading to suggestions he may have picked up an injury - despite completing the full 90 minutes. But Senegalese media have moved to calm any nerves, with Metro Dakar suggesting his reaction was purely based on his performance. They said: "There is no indication that he is injured. The Liverpool player seems sad because of his bad match. "Mane missed an opportunity in the second half which was met by boos from supporters - the latest in a string of criticisms Mane has faced in his homeland for failing to replicate his Anfield form for his country. Ungrateful ignorant cu*ts he should tell them all do one and retire from international footy. I agree, f**k em, he's scored plenty for them and everyone can have a bad game FFS! It's disgraceful from their fans and shouldn't happen. He has been massively hit and miss this season though looked like more of the miss type performance in his last outing for Senegal. He needs to grow a pair and get his head out his arse. This is the other side of the argument that is valid and hard to ignore. Mane has been playing for himself for a little while now and has passed up easy chances and opportunities for others. Maybe this will be the wake up call he needs. They are not grateful for what he has done but he needs to grow up. He should not be affected by boos.